With thousands of migrants in Tijuana hoping to find asylum in the United States, local advocacy groups are stepping up to help. U.S. Immigration and Customs Enforcement on Oct. 23 stopped reviewing “post-release plans” for families along the southern border. In the past ICE used to review these plans, which in part made sure families had secure travel arrangements — but ICE said with an uptick in family crossings at the border, they do not have the capacity to do those reviews anymore. San Diego Rapid Response Network’s Katie Clark said it has set up a shelter to help families released from custody. "Shelter operations are very expensive," said Clark, who is also director of immigration at Jewish Family Service. "Providing daily shelter with food, water, medical, triage, legal services — those are all the supportive services that we’re offering to each migrant that comes through the shelter on a daily basis." In a statement Monday ICE told KPBS, "Family units that are released will be enrolled in a form of ICE’s Alternatives to Detention or released on another form of supervision. Aliens will be issued a Notice to Appear in immigration court, as appropriate. ICE continues to work with local and state officials and NGO partners in the area so they are prepared to provide assistance with transportation or other services." 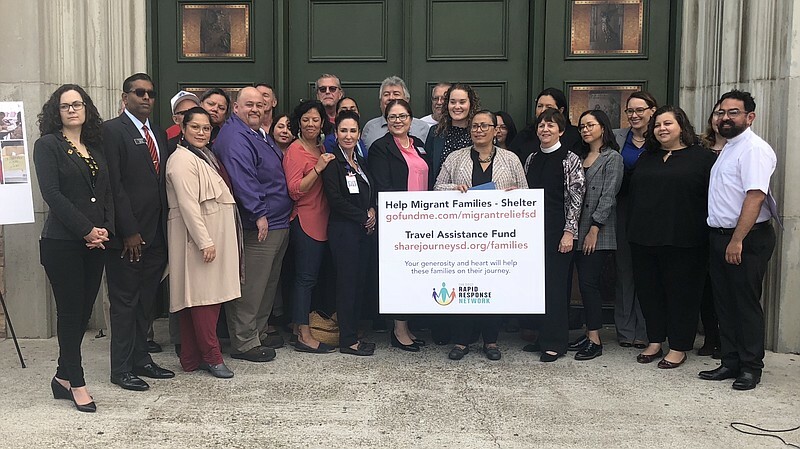 The Catholic Charities Diocese of San Diego has created a travel fund to help asylum seekers reunite with their families. The San Diego Rapid Response Network has a 24-hour hotline for people with an immigration emergency. The number is (619) 536-0823.